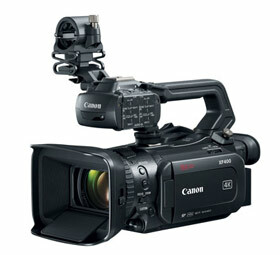 The Canon Professional XF400 is Canon’s Pro 4K Ultra HD Camcorder. 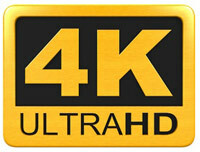 4K Ultra HD has 4x the resolution of full HD, the same resolution used on 4K TVs and Movie Theater 4K projectors. The XF400 upgrades the popular XF Pro Series with many new features. The Canon Pro XF400 has a new much larger (1-inch) 4K UHD CMOS Imager with Wide Dynamic Range Gamma and improved low light performance. Compact in size. Records video in 4K Ultra HD at up to 60fps, and Full HD at up to 120fps. Records to SDHC/SDXC memory cards (camcorder has two memory card slots) The 15x zoom HD Video Lens delivers excellent image quality and low light performance even at full zoom. The Professional XF400 features the new 5-Axis image stabilization (keeps video sharp in low light, or when holding the camcorder without a tripod). Another big first is the inclusion of the excellent Dual Pixel AF a high-speed, high-precision autofocus technology to a consumer camcorder. The new Dual Digic DV6 Processors are what powers these new advanced features, including 4K @60fps (4K 60p), and 1080p @120fps. The Large 3.5-inch high resolution touchscreen is the highest resolution screen on a camcorder that we have reviewed. For Sound, the Pro XF400 has Dual XLR inputs, and external microphone and headphone jacks for recording and monitoring audio. Canon Professional XF400 Features:The Pro XF400 4K Camcorder has an HDMI 2.0 terminal that supports 4K UHD 60p output to a standard external SSD/HDD recorder. Mini Advanced Accessory Shoe to add an external light or microphone. Dedicated manual focus ring. Features a high resolution 3.5 inch LCD screen (1.56 million dots). Also included is a 0.24-inch color viewfinder (1,560,000 dots). 2 channel stereo sound. The XF400 has 5 assignable buttons to customize as your please. Built-in ND filters. Built-in Wi-Fi® technology allows you share video files wirelessly to your PC or favorite social network using internet browsers, smartphones or tablets. Battery Pack BP-828 included. You can remotely control key functions of your camcorder wirelessly using the Wi-Fi Remote control features. Slow and Fast Motion recording available. The Pro XF400 records for 55 minutes in 4K to a 64GB memory card. Canon XF400 Dimensions: 5.9″ x 8.5″ x 10.5″ (3.7 pounds w/ battery & XLR). XF400 Standout Features: 4K Video, 4K @ 60p, 1080p@ 120p, 1-inch Imager, Dual Pixel AF, 5 Axis Image Stabilization, ND Filters, Dual Card Slots, Dual Digic DV6 Processors, new 4k Lens, Dual XLR inputs, Ethernet (RJ-45) connector, Infrared Night Vision. Smart-Review Commentary: The new Canon Professional XF400 4K Camcorder has improved its Pro camera XF line. Canon has added 4K Ultra HD to the XF400, XLR Audio Inputs, now has a 1-inch imager which is 6.8 times larger than the 1/2.84-inch imager in previous XF camcorders for better low light performance, higher dynamic range, and shallower depth of field. Canon has added its best autofocus system the Dual Pixel AF to this camcorder. And finally Canon has added 5 Axis image stabilization to the Pro XF400. This is the most fully featured consumer camcorder we have covered. A detachable lens hood (which prevents light glare) is included as well as an improved larger eye cup, when using the camcorder’s EVF viewfinder. The viewfinder has 5x the resolution of most viewfinders with 1.5 million dots. The Canon Pro XF400 uses dual SDHC/SDXC memory card slots for long recording times. Double Slot Recording can record to two SD cards simultaneously as a safety backup. External Mic Jack for enhancing your sound options, and headphone jack to monitor sound. Professional-quality 16-bit PCM recording is available for best sound quality. The powerful Dual Digic DV6 processors allow the XF400 to record 4K at up to 60fps, and Full HD at 120fps. The Dual Pixel AF offers a dramatic improvement in auto focus speed and accuracy. Great for sports. The Canon Professional XF400 is a SmartReview Top Pick for 2019 for Pro Camcorders.